There have been vines on the island since Ancient Times (564 BC when the Phoenicians founded Aleria). Trade in wine was developed from the 14th Century by the Genoese, who exported it to Italy. Vineyards continued to grow reaching 20,000 hectares before phylloxera arrived. In the 60s, they were geared to volume production until certain growers decided to gamble on quality, led by figures such as Christian Imbert. A policy of vine ripping has been adopted. The current surface area is estimated at 7,000 hectares against 32,000 in 1976. The climate is marked by a high level of sunshine (at 2911 hours Ajaccio beats the record in France), humidity from the sea and mountains, low rainfall (six times less than Bordeaux); frost is very rare, spring comes early and summers are hot. 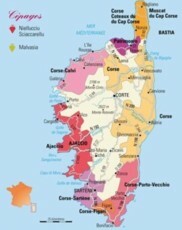 In this climate, the hard work of 350 growers – a third of them devoted to making top of the range wines – creates a variety of quality wines in varying styles: white wines perfect with sea urchin, fine Muscats (Clos Nicrosi on Cap Corse, Antoine Arena in Patrimonio), elegant rosés (Clos Landry in Balagne), fruity reds (AOC Calvi), one-off wines (Jean-Charles Abbatucci’s Cuvée Faustina). If on average they reach their peak at three to four years, some growers aim for 10 years; the wines speak for themselves. Corse Porto-Vecchio (just two producers in Lecci) (3 producers) ??? There’s also the Vin de Pays de l’Ile de Beauté label (literally country wine from the beautiful island!). Even though several varieties are authorized, production mainly centres on the distinctive local grapes Nielluccciu (red, especially in Patrimonio’s clay-limestone soils), Sciaccarellu (red, suits the island’s granite soils) and Vermentinu (white). In this Corsican mountain garden (or mountains of gardens), vineyards are indistinguishable from countryside and, for example, you can just as easily take the GR 20 trail (on foot) from Calenzana (AOC Corse-Calvi), as follow (by car) the road over the Teghime pass above the Patrimonio plains and the gulf of Saint-Florent. Each time, make a note of the journey time; sometimes it takes ages. Don’t miss the ‘Foire aux Vins de Luri’, Luri wine fair (July).